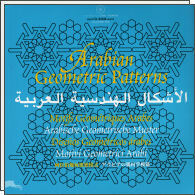 Without any doubt, Arabian geometric ornament is among the most sophisticated forms of design of all eras. For Arabian Geometric Patterns, a very large collection of the most beautiful and intricate of such designs has been meticulously re-drawn and digitised. All files are recorded on the accompanying CD-ROM; these files have been made with such precision that the core items can be interlocked, allowing for limitless repetition.